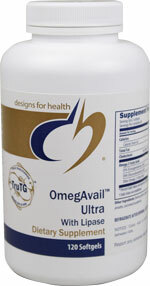 OmegAvail™ Ultra (formerly OmegAvail™ Ultra TG) still provides the same levels of omega-3 fatty acids per serving. 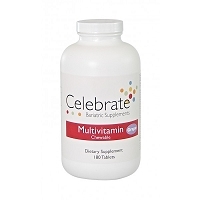 The only change – Designs for Health has enhanced this product with the addition of lipase, a digestive aid. 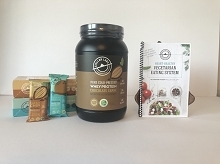 OmegAvail™Ultra still carries the Designs for Health TruTG™ seal, your assurance that the fish oils are in their natural triglyceride form and are of unmatched TG potency. Fish oils in the TG (triglyceride) form are as they occur in nature. Fish oil blends and concentrates bearing the TruTG™ seal are 90% to 100% triglyceride (TG) bound omega-3 oils – 40%-50% higher than the industry standard for TG fish oil concentrate products! Why the addition of lipase? Lipase acts as a digestive aid. 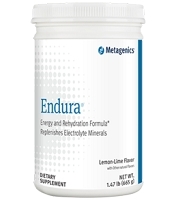 It is an enzyme needed for breaking down lipids (fats). Lipase is primarily produced in the pancreas but is also produced in the mouth and stomach. While most healthy individuals produce sufficient amounts of pancreatic lipase, everyone can benefit from its inclusion as it relates to better digestion of fish oils. Other Ingredients: Bovine gelatin, glycerin, water, natural lemon flavor, lipase, annatto, and mixed tocopherols.